Welcome Back to A Blessing and A curse. 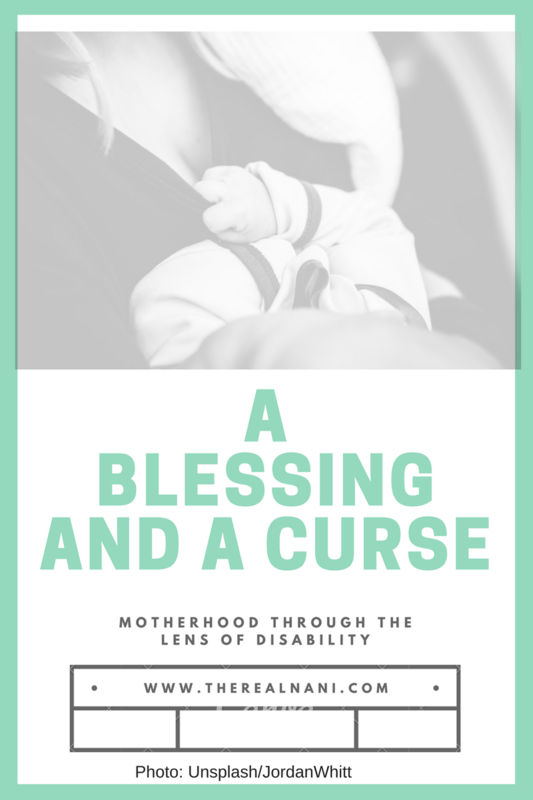 I took a not-so-brief hiatus but I’m excited to bring you more stories of mothering with a Disability. In this 3rd installment of A Blessing and a Curse, I welcome Olivia DeMoray. Olivia shares the particular challenge of having an invisible disability, the result of being injured in the line of duty. My name is Olivia DeMoray. I’m a rarity in San Diego – a native, but I’ve lived all over thanks to my time in the US Army. I have one daughter who just turned 3 and a pretty dynamic situation at home. My daughter’s father and I have been separated since the end of 2015, him living on his own (but in our neighborhood) and me living with my parents. We split our time 50/50 as much as possible with the kiddo and at this point have essentially got it down to a science. In my “free time” (and I say that lightly) I enjoy photography, working with my hands and watching too much Netflix. In January 2012, I was injured while training with the United States Army at Fort Jackson, South Carolina. Because of the fast pace of training, I did not receive proper medical care and was pushed along the line – like so many others. Upon return to San Diego, I received a second opinion, where an MRI revealed a torn labrum in my right hip. The doctor recommended surgery immediately to repair the injury. The outpatient surgery was performed October 2012. After surgery, I attended physical therapy regularly, but continued to experience pain over the course of the next 2 years. Further MRI and X-ray imaging evaluated by doctors and specialists did not show any significant changes to my body’s structure and I was dismissed as having phantom pain. Physical therapists insisted that the pain and symptoms would improve with time and therapy, but they did not. After years of pain in my hip, I began to experience numbness in my right leg and back spasms at the end of 2015. After months of referrals I was finally able to meet with an orthopedic specialist who told me she assumed I had at least one herniation on my spinal cord. I received an MRI and one week later her suspicions were confirmed: herniations of L3-4, L4-5 and L5-S1 as well as 2 synovial cysts. An MRI of my hip also revealed that the labrum had torn again. But How Does This Impact Me As A Mother? Going through all of this has been frustrating, to say the least. When I was pregnant with my daughter, the weight of the pregnancy on my hip and nerves and back was unbearable. There was no such thing as exercise because there were days that I could not feel either of my legs. The pain was excruciating, and the only thing that I could do to withstand it was get in the swimming pool and become weightless. In addition to the pain, there was the complication of birth: I was forced to have a c-section. My daughter was transverse-breach, meaning that she was laying sideways in my womb, with her bottom down and hands and feet up by her face. She never did turn, and my doctors didn’t want to risk natural birth in case the pressure on my hip were to cause further injury. A lot of people say I’m lucky to have had no choice, but I feel like it was taken from me because of my disability. So to begin with, before I even became a mother I was affected. Recovering from a c-section is not an easy feat, but it’s usually one that is done with support and for the most part, success. When you mix major abdominal surgery with someone who already has a disability, the outcome is bleak. I laid in bed for what felt like months. The furthest I could go most days was into the car for a short trip or halfway around the block. I never had the ability to recharge and feel like myself after the surgery. I always felt like I was 3 steps behind and I hid it, because I was fearful of what people would think. Fearful they would see my inability to care for her and for myself and shame me. Couple this with extreme postpartum depression (which I have since overcome, thankfully) and you have a recipe for an incredibly difficult task as a mother: loving yourself and loving your child, despite everything. Some days it hurts to admit that I didn’t truly know what loving my daughter was until she was almost 8 or 9 months old because I was in such a fog, but it is the truth. Imagine this: you’re dreaming of a nice hot shower. You can almost feel the water on your skin. Your child is napping peacefully in their crib or pack and play – somewhere safe and you know that you have the time to sneak away. But you don’t, and it’s not out of guilt. It’s not out of fear that something could happen to them. It’s because the last time you showered without someone else home, you fell and hit your head. You’re not sure how it happened. One second you were standing there and the next you were on the floor of the tub, sobbing. You couldn’t feel your right leg and there were spasms of pain rolling across your back. Now imagine the fear of this, with a child. I worried that if I were ever alone with her, there may be a day where I would fall and wouldn’t get up and she would be left to fend for herself. There are 2 main aspects about any disability that are very difficult. The first is physical – Being present, but not being active. Now I have a 3 year old that moves lightning fast. She wants to run and jump and roll and pounce and roughhouse, just like any other child. She wants to be pushed on the swings. She wants to be lifted onto the counter while I brush her hair, to see in the mirror. She wants me to pull her into bed with me to snuggle when she can’t sleep. These are all things that any other parent would have no trouble doing, but I cannot. And it’s not for lack of trying – trust me, I’ve huffed and I’ve puffed and I’ve thrown out my back on multiple occasions. But it isn’t worth it for those 45 seconds of whatever we are doing to be laid up in bed for 3 days. It was almost easier when she didn’t understand and was blissfully unaware. She would just continue on playing with something else or distract herself. Now, she acknowledges the issue: “Mommy, your back hurts,” “Mommy, it’s okay, I can do it,” “Mommy, I’m sad you’re hurt.” Just like that, I’m not the only one this impacts anymore. So the biggest difficulty mentioned above has been physical, being that I have major limitations. And the more minor but still just as prevalent difficulty is the emotional side of it – not being able to show my daughter all of the wonderful things that we can do with our bodies because mine is broken. She is old enough now to comprehend what it means when I tell her that I can’t right now, or maybe in a little bit. For most parents this might mean they were busy and for me, it’s because I know that if I get down on the ground with her there are days I probably won’t get back up. She studies the pain in my face and it translates to hers as sadness. I used to hide it from her, but now I wonder if that’s even worth it. I don’t want her to think that she causes me any discomfort but I also don’t want her to grow up thinking that I don’t love her and don’t have time for her. As much as I need to keep it from her, I need her to understand that I do my best. And all that I ask is that she does the same. I don’t want her to see me struggle and fail and not continue trying, because that’s no lesson to teach your children. But they should watch you struggle because that is how you teach them perseverance and strength. That it is okay to fail so long as you continue approaching it from different angles. The final aspect that isn’t necessarily from a mother’s standpoint (well, sort of) is social. There are so many people who will never understand what it is like to feel the way that I do. Not to say I would wish this on anyone, rather that I wish there were more grace and understanding in accepting those who have disabilities, even if they are not completely visible. We have to do all of the same things that everyone else does and often times, they’re not modified to assist us in any way. I’ve been uninvited from playgroups and pushed out of friend circles because I’ve been deemed so many different things including hurtful words such as unreliable and cynical. And that’s unfair to me but it’s especially unfair to my daughter, who didn’t ask to have a parent with a disability. I don’t want to be your hero or your inspiration, I just want you to know that people are out there with invisible illnesses and disabilities. It’s real and often times you don’t know even half the story. Is There Anything Good That Comes From This? Yes. There absolutely is good. As much negativity as there is in living with life-altering disabilities, there is just as much (if not more) positivity. Because any other person who has a normal day might not think twice about it but me? It’s like a day at Disneyland. If I can go through my day with no spasms, no numbness, no tingling, no loss of feeling, no migraines or pain or discomfort – sometimes I think I’m dreaming. And it doesn’t happen very often but when it does, it’s amazing. We have to cherish the little moments of happiness and remember to hold onto them when there are clouds overhead. I have my immediate family who supports me. I have the disability support assistance program at the community college I attend. I have the understanding and support of (most of) my doctors and everyone who has been a part of it for the last 5 years for the most part is working together to try and make it easier. Including my kiddo, who is helpful as often as she can be. She loves to load the washing machine, put away her toys and tell me “I can do it by myself”. And it isn’t just because she is a toddler, but because when she does these things I verbally acknowledge how appreciative I am of her and what she does. Instilling pride and responsibility in children from a young age is not always an easy thing to do. I can imagine that any parent may have trouble slowing down to explain something to their child, but most of the time mine is the one waiting on me instead of the other way around. This means that she has learned wonderful patience and for being 3, that’s a challenge in and of itself. She knows to take a deep breath when she is over-excited, or will remove herself from the situation and say “I’m not ready”. I’ve taught her from day one that this is okay because she has the RIGHT to know when she is and isn’t ready for something, be it emotional or physical. I don’t think we give our kids enough credit sometimes in their ability to understand the world around them but I am blessed with a little girl who is kind and loving and sees past my disability and straight into my heart. And she does this with all children and adults, no matter their struggle. She just wants to help everyone around her and make them feel included. And there’s nothing better than seeing her bring that light to this world. I’ve learned so much over the years from having a disability but the biggest thing is something a previous employer once said to me: know your worth. Despite all of the hurdles, despite the physical and emotional ups and downs, despite the uncertainty I know this much is true – my daughter will grow up knowing the value of her life and know that no matter what, there are no limitations to what she can do. No matter what anyone tells her. Thank you for sharing, Olivia!